When you stay at Sonoma Orchid Inn in Forestville, you'll be next to a golf course and 8 minutes by foot from Korbel Champagne Cellars. Featured amenities include complimentary newspapers in the lobby, luggage storage, and a library. Free self parking is available onsite. With a stay at Village Inn & Restaurant in Monte Rio, you'll be within a 15-minute drive of Northwood Golf Club and Pee Wee Golf and Arcade. Free self parking is available onsite. 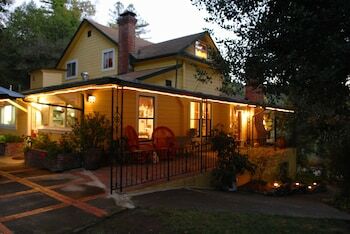 Located in Guerneville, this vacation home is convenient to Johnson's Beach and Pee Wee Golf and Arcade. With a stay at this cabin in Guerneville, you'll be convenient to Johnson's Beach and Pee Wee Golf and Arcade. When you stay at Dawn Ranch Lodge in Guerneville, you'll be next to a golf course, within a 5-minute drive of Pee Wee Golf and Arcade and Johnson's Beach. Free self parking is available onsite. With a stay at Riverlane Resort in Guerneville, you'll be a 1-minute walk from Johnson's Beach and 9 minutes by foot from Pee Wee Golf and Arcade. When you stay at Applewood Inn and Spa in Guerneville, you'll be near the beach, within a 10-minute walk of Pee Wee Golf and Arcade and Johnson's Beach. Free self parking is available onsite. With a stay at Guerneville Lodge in Guerneville, you'll be within a 15-minute walk of Johnson's Beach and Pee Wee Golf and Arcade. Free self parking is available onsite. With a stay at Bodega Bay Inn in Bodega Bay, you'll be within a 10-minute walk of Children's Bell Tower and Bodega Dunes. Free self parking is available onsite. When you a stay at this vacation home in Bodega Bay, you'll be near the beach, just steps from Sonoma Coast State Park and Bodega Dunes.